(CNN) -- The world's top pound-for-pound fighter, Manny Pacquiao, will attempt to win a world title in a fourth division by taking on three-time world champion Miguel Cotto in his next bout. 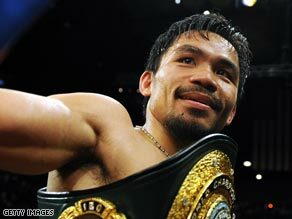 Manny Pacquiao will take on Miguel Cotto in his next fight scheduled for Novermber 18. The Filipino boxer will fight the 28-year-old Puerto Rican for the WBO welterweight title at the MGM Grand Garden Arena in Las Vegas, America on November 14 it has been confirmed. Promoter Bob Arum, who represents both fighters, announced that although contracts still need to be signed, verbal agreements have been given: "I'm very excited about this because it's a good fight for boxing [and] it wasn't difficult to do, because they both wanted the fight," Arum told the Los Angeles Times. Pacquiao is a national hero in the Philippines but has seen his popularity grow around the world since his comprehensive victory over British fighter Ricky Hatton in Las Vegas. The man dubbed the "National Fist" is currently rated by The Ring, the sport's most respected trade magazine, as the best boxer in the world. His career earnings stand at an estimated $50M and he stands to bank further millions with the Cotto fee, however, Arum has yet to announce how the purse will be split. Pacquiao has been in devastating form in recent times, racking up a string of victories in four different weight divisions. Mexico's super-featherweight Juan Manuel Marquez was dispatched by the "Pac Man" before the 30-year-old secured further wins against America's David Diaz (lightweight) and Oscar de la Hoya (welterweight) before a devastating show of force against British light-welterweight Ricky Hatton. Cotto survived a recent split decision result against Ghana's Joshua Clottey despite suffering a bad cut over one of his eyes during the bout and has only lost once in his career thus far to 31-year-old Mexican Antonio Margarito. Arum said a press tour with the fighters will start Sept. 9 in Los Angeles.